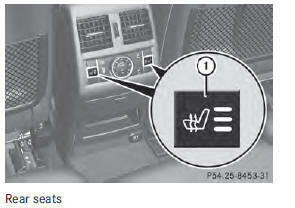 Repeatedly switching on the seat heating can cause the seat cushion and backrest pads to become very hot. The health of persons with limited temperature sensitivity or a limited ability to react to excessively high temperatures may be affected or they may even suffer burn-like injuries. There is a risk of injury. Therefore, do not switch the seat heating on repeatedly. 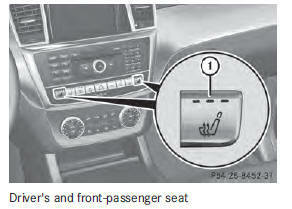 ■ Make sure that the SmartKey is in position 1 or 2 in the ignition lock. ■ To switch on: press button 1 repeatedly until the desired heating level is set. ■ To switch off: press button 1 repeatedly until all the indicator lamps go out. ■ To switch on: press button 1 repeatedly until the desired ventilation level is set. You can open the side windows and the sliding sunroof using the "Convenience opening" feature . The seat ventilation of the driver's seat automatically switches to the highest level.